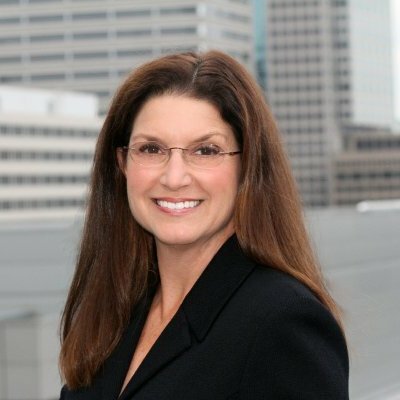 Susan Friedman is part of Ciena’s campaign marketing team and is experienced in developing processes for change management. In this post, Susan details her process for overcoming the fear of change in challenging situations. Change is always hard. But for today’s network operators, managing the rapid changes in their networks can feel like an impossible task. In 2014, mobile payment platforms, smart homes, and wearable technology found value with consumers and jumped in popularity. Backed by household names like Apple and Google, these technologies are poised for incredible growth. The wearable technology market alone is estimated by Business Insider to reach $12.6 billion by 2018. The common thread that connects these devices to content and returns valuable information to users is the communications network. This network is already trying to keep up with the demands of mobile users, video streaming services, and cloud applications. Network operators trying to get ahead of this leap in demand are at a technology crossroads: Do they stick with what they know or create a new path? Whether you’re adding capacity or adopting an unproven business model, change is hard – but getting ready for change doesn’t have to be scary. By following a few simple steps, network planners can move past the panic attack to thrive in what may seem like a mountain range of endless choices. 1) Know your market: Analyzing user activity and network traffic, talking to customers, and investing in primary research are all great ways to learn about where your market is headed. Read up on trends and become an expert in what users expect from your network. Anticipating the impact before it hits is the first step in planning a change path. 2) Know your choices: Do your homework and build your knowledge base, get involved in conferences by reading all the available papers, and make an effort to network with others who face the same issues. Bring in the experts to share their knowledge and approach. The more you know, the more confident you’ll feel with your decisions. Use your knowledge and network of experts to create a strategy, an approach to tackling the big goal. 3) Define specific goals: Frame the problem you’re trying to solve. Big change seems insurmountable, but if you break it down into a series of reachable goals, your heartbeat will go back to normal. Too many ideas can freeze your brain and make it difficult to see a way forward; to keep yourself from becoming overwhelmed, write down all of the thoughts that keep you awake at night. 4) Build scenarios: Don’t be paralyzed by fear of moving forward. You have the knowledge and goals, now it’s time to tackle the change plan head on. Outline plans of attack for each of your goals, including a few different scenarios. The worse case scenario is to remain frozen and do nothing. Your customers are not standing still, so neither can you. 5) Build a goal staircase: “OMG I’m never going to see my family!” is the reaction to most tough timelines. Avoid the freak out by using a goal staircase, which maps the smaller goal steps you’ll take to achieve change. Place the long-term change goal on the top and break it down into smaller quarterly, monthly, and weekly goals based on the strategy you developed during the homework phase. Note a few goals along the way that you can tick off fast (i.e., identify the team, source resources, create a knowledge-building plan). 6) Communicate, communicate, communicate: Create a cadence of communications. The more you share, the more audiences will see progress and, as you see changes happen, your stress will diminish. At every checkpoint, don’t just offer a status; translate the impact of the change and share what you’ve learned along the way. 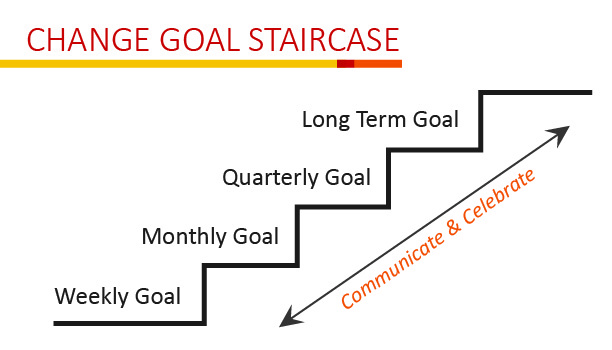 Update your goal staircase based on the knowledge you’ve gained and reshape the original scenarios with real information. And, most importantly, don’t forget to celebrate success. Change is hard, but there’s no reason to panic. If you break it down into specific steps, attacking each one head-on, you can go from deer in the headlights to productively managing for success – one step at a time.